After numerous tussles with Brahm we often quoted a well-drilled martial art coaching tip to each other, “Control the head….control the body”. Meaning, you lock the opponent’s head in a disarming position and it’s very hard for them to retaliate with the rest of their body. It’s a similar thing with your New Years’ Goals. If your body feels too tired to exercise, tell your mind, “Do it anyway”. Most often, you will GAIN back that energy within minutes. Your subconscious mind doesn’t distinguish between what’s right and wrong. You can easily be tricked. Some years ago in France a criminal was condemned to death. A rather cruel experiment was conducted on him. 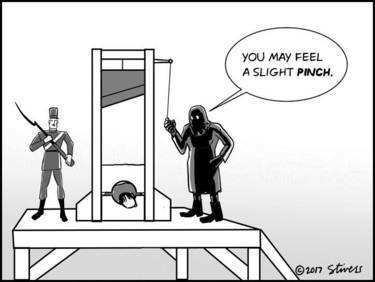 He was brought to the guillotine and his head placed under the knife, after he had been blindfolded. A heavy sharp-edged plank was then dropped on his neck, producing a shock similar to a sharp edged knife. Warm water was gently poured on his neck and allowed to trickle slowly down his spine, to imitate the flow of warm blood. Within seven minutes, doctors pronounced the man was dead. His imagination, through the principal of suggestion, had actually turned the sharp-edged plank into a guillotine blade and stopped his heart from beating. You can use the focused energy of your mind for POSITIVE CHANGE. Your mind is far more powerful than you might imagine. Master your thinking and your New Years’ Goals will become real. Remember, ‘Control the head, control the body’. Stress is not your enemy!